President Medvedev’s decree today formally dismissed General-Lieutenant Andrey Tretyak, Chief of the Main Operations Directorate (GOU) and Deputy Chief of the General Staff, from military service. Recall 52-year-old two-star Tretyak was one of the “general troyka” whose early departure from the army was debated in the media this summer. 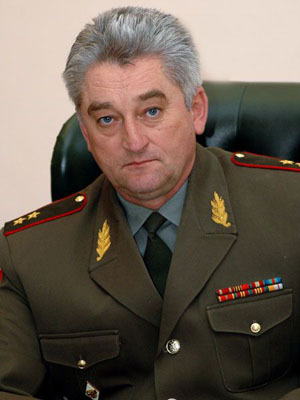 Taking Tretyak’s place at the GOU is General-Lieutenant Vladimir Borisovich Zarudnitskiy. Here are some of his particulars courtesy of RIA Novosti. The 53-year-old general-lieutenant was born on February 6, 1958 in the Abinsk, Krasnodar Kray. In 1979, he graduated the Ordzhonikidze Higher Combined Arms Command School in Vladikavkaz. He commanded a platoon and a recce company in the GSFG until 1985. In 1985-1987, he was recce chief in a GSFG regiment. He attended and completed the mid-career Frunze Military Academy in 1988-1989. In 1991-1994, he picked up his career in the Far East MD as chief of staff, then commander of a regiment. In 1997-1999, he was chief of staff, then commander of an independent motorized rifle brigade in the North Caucasus MD. He graduated from the General Staff Academy in 2003, and commanded the 27th Guards Motorized Rifle Division in the Volga-Ural MD until early 2005. Until early 2007, Zarudnitskiy was chief of staff, first deputy commander of an army in the Siberian MD, and then commanded the Siberian MD’s 36th Army based at Ulan-Ude until April 2009. From 2009-2011, he was chief of staff, first deputy commander of the Moscow MD. When the six existing MDs were reformed into four, and the Moscow MD disappeared, Zarudnitskiy was assigned as deputy commander of the Southern MD until his appointment as GOU Chief today. Zarudnitskiy’s a troop general, not a staff officer. Like several other generals who’re moved upward, he served some time directly under General Staff Chief Nikolay Makarov in the Siberian MD. Once larger in size and stature, the GOU must be a tough assignment these days. Zarudnitskiy is the organization’s fourth chief in four years. Returning to the three generals’ resignations . . . the Defense Ministry press-service came out quickly denying any “scandalous” general officer discharges. The press-service said General-Lieutenant Andrey Tretyak, General-Lieutenant Sergey Skokov, and General-Major Oleg Ivanov requested discharges for health reasons at different times. But it also indicated the Central Attestation Commission (TsAK, or ЦАК) is reassigning generals to duties in the military districts under Defense Minister Serdyukov’s policy of rotating officers through different posts, and away from Moscow in particular. A Defense Ministry source told ITAR-TASS the generals’ discharges are not part of any mass dismissal of officers from the Defense Ministry’s central apparatus. The press was skeptical about three young and vigorous generals suddenly seeking a medical discharge, and it focused on their intent to avoid undesirable reassignments. Newsru.com and Moskovskiy komsomolets reported in this vein. A Defense Ministry source told news agencies one in three requests for early retirement involves officers who are being reassigned from Moscow to a military district post. The source claimed these cases are usually incorrectly characterized as opposition to military reforms. Tretyak himself told Interfaks his resignation is not connected with Armed Forces reforms or disagreements with the leadership. Then Deputy Defense Minister Nikolay Pankov talked to Rossiyskaya gazeta, giving a version of events varying from the press-service’s initial report of discharges for health reasons. What did military commentators say? In IA Regnum and Gazeta.ru, Anatoliy Tsyganok said the generals’ resignations show things aren’t quite right in the Defense Ministry, but also called reports of problems with Makarov a falsehood. He said the incident shows it’s not just military retirees who bring attention to poorly thought out reforms. At the same time, he doesn’t get the focus on Makarov when he just implements Serdyukov’s plans. Tomorrow’s Nezavisimaya gazeta reports Defense Ministry sources claim several young, promising generals have tendered their resignations because of problems with General Staff Chief, Army General Nikolay Makarov. NG says they include Deputy General Staff Chief and Main Operations Directorate Chief, General-Lieutenant Andrey Tretyak, First Deputy Ground Troops CINC and Main Staff Chief, General-Lieutenant Sergey Skokov, and Genshtab Electronic Warfare Directorate Chief, General-Major Oleg Ivanov, and others. The paper describes these guys as the Russian Army’s future leaders. So why do they want to quit? The reasons, unfortunately, haven’t been advertised (yet). NG points out that, if Tretyak leaves, the GOU (the cerebral cortex of the “brain of the army”) will have its third chief in four years. Skokov has been a key man working on automated C2 (YeSU TZ or ЕСУ ТЗ). A “highly-placed” anonymous officer says it’s because of their disagreement with army reform steps taken by Makarov. And explicitly not because of any problem with Defense Minister Serdyukov, whom they regard as an effective manager. The source implies time, money, and other resources have been wasted trying to develop automated C2 for old-fashioned, World War II-type operations. And this is why Skokov requested his discharge.